Lawn aeration is an importance aspect of lawn maintenance in Reno because removing many small plugs of soil and grass helps water, nutrients, and oxygen to better penetrate the roots. It is true that it’s ideal to aerate your lawn in the fall when it’s less likely to see high traffic in coming weeks and months. However, if you overlooked aeration in the fall, you can still aerate in the spring and see good results. Here are some things to consider about aeration as part of your lawn maintenance. The notion that the grass should only be aerated in the fall is actually a myth. This is because your grass will benefit most from being aerated twice a year, once in the fall and once in the spring. 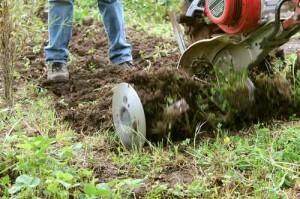 However, there are advantages unique to spring aeration that many are unaware of. Aerating in the spring helps to reduce thatch, which is a breeding place for bacteria, insects, and fungi. Spring aeration can help prevent problems that develop from excessive thatch throughout the spring and summer growing season. Many choose to dethatch at this time as well, which is a power raking process to further remove excess thatch. Aerating in the spring allows the entire growing season for the grass to heal and fill in areas that were removed. With proper fertilization and herbicide application, the grass will fill in the plugs nicely rather than with weeds. Aerating in both the spring and fall increases the overall health of your lawn, which means that it will be much more difficult for weeds to sprout or take control of your lawn. Although aeration won’t eliminate weeds in your lawn, it will make it harder for them to grow because your lawn will be better able to compete. The same is true of fungal diseases because there is better water and air movement in the soil, making it harder for fungal diseases to survive. This entry was posted in Landscaping by Evette. Bookmark the permalink.